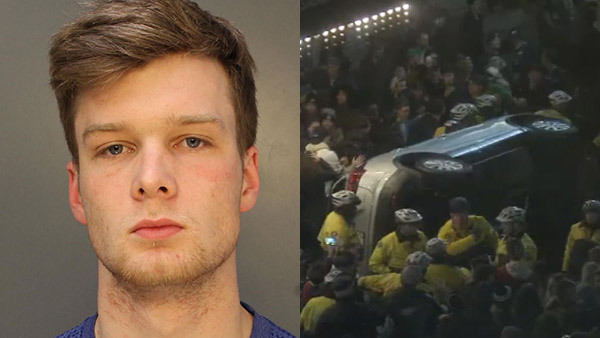 PHILADELPHIA (WPVI) -- A Villanova University basketball announcer's son who was arrested for flipping a car after the Philadelphia Eagles' Super Bowl win won't do any jail time. Court records show 20-year-old John Rigsby was recommended for a year-long accelerated rehabilitative probationary program on March 16. Once he completes the program, his arrest record can be expunged. A message seeking comment from his lawyer wasn't returned Monday. His father is Robert "Whitey" Rigsby, the longtime broadcaster for the team that's heading to the Final Four. Videos on social media show the younger Rigsby, wearing a white Nick Foles jersey, pounding his chest in celebration after flipping the car. Pockets of victory celebrations turned unruly last month. Rowdy fans smashed windows at department stores and toppled some of the city's famously greased light poles.